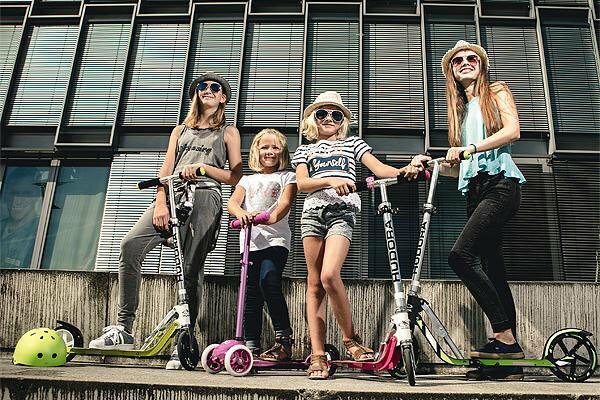 →How to Choose The Right Kids Scooter? Planning to by a scooter for your growing child? Confused about what factors to consider? We are there to help you. If you want to gift your child the best scooter, you have to consider some features of the scooters and also the age of your child. You also need to think about the safety of your child. We are providing you an overview of how to choose the most suitable kids scooter for your kid. What is the Best Scooter for Kids? Scooters may have two to four wheels. The more is the number of wheels, the more is the stability of the scooter. The stability of two-wheel scooter is less than three- and four-wheel scooters. So, it’s suitable for the second step learners, who already have control over stability and can balance themselves. Three-wheel scooters are appropriate for beginners. There is no risk of imbalance and hence the chance of accidents is also less. So, if your child is first time learner, then you should choose three-wheel scooters. Parents must also consider the height and weight capacity of their kids. The scooter must be strong enough to carry out the weight of your child. You should inquire about the maximum weight limit the scooter can carry away. Because your child may carry a backpack, or he may take his friend along! The scooter must be adjusted with the height of your child so that he/she can hold the handles of the scooter comfortably. The break of the scooter should be of good quality so that it works properly in emergency situations and your kid gets saved from accidents. Scooters can be made with plastic, metal or both. Plastic scooters are light, so flexible to handle. But it can be suitable only for kids less than three years as it can’t take heavyweight. So, you have to choose scooters of strong metal for kids more than three years old. You must consider the maximum speed of the scooter according to the demand of your child. The beginner child doesn’t need high speed. Lower maximum speed is better for beginners to ensure the safety. If he uses the scooter for going to school faster, he will need more speed. It’s the most important thing that you have to consider while buying a scooter for your kid. The types of scooters vary from age to age. What Age Can a Child Ride a Scooter? In order to handle a scooter, your child should be first able to handle him/herself! You can allow him/her to ride on a scooter at the age when he/she can sit-up or walk properly and has a control over own balance. Otherwise, it will be risky for your child as he can fall anytime. What is the Best Toddler Scooter? Choose three- or four-wheels scooters for your 1-2-year-old kids as it will be easier for your child to learn to ride and keep balance. You may find three-wheel scooters as the better option since scooters with four wheels are heavier and it will be difficult for your child to handle it. You may try smaller scooters that are specially designed for 2-3-year-old kids such as Razor E90 or Razor E100. The frame size is smaller; the highest speed is lower than the others and has a smaller frame. For a younger child, it’s not enough that you only select good features in the scooter. You have to make sure that he uses it under your observation and don’t go to public roads with a scooter. What’s the Best Scooter for a 5-Year-Old? You can give a two-wheel scooter to your child at this age if he already has the experience of riding three wheels scooter at an early age. But if he is going to ride for the first time, he should begin with three wheels. What is the Best Scooter For 6 Years Old? For advanced learner kids, it’s required that the scooter gives them fun. Their spatial awareness and control over motion will increase at this age. They can try scooters with two wheels and narrow platform at an advanced level. The scooter should provide higher speed and the wheel size should be larger to cover a longer distance. Choose a scooter with strong material for long durability. When Should You Buy a Tricycle? Simply you should buy a tricycle when your child is able to handle it physically. Generally, it’s around three-year-old age when a child is able to do that. But you have to be much careful that every time he uses the helmet and don’t ride a tricycle on busy roads as the little tricycles are not visible from giant vehicles. What Types of Scooters are Available in The Market? Pro-scooters or trick scooters are very durable advanced level two-wheel scooters. They are designed for those who are willing to do ‘freestyles’ on their scooters. Conventional scooters are not able to endure the stress of stunts. The electric scooter is powered by electricity. It is chargeable, and the battery makes your riding effortless. You can stand on the step-through frame of the electric scooter while riding. You don’t need to push the scooter frequently. You can go a long distance using electric scooters, but you have to be more careful about balancing. Caster scooter is a type of three-wheel scooters with one wheel at the front and the two others in the back are at a wide distance. The footstep is wider which is not common in other scooters. After reading this analysis you have known much about the kid’s scooter! Now go to the shop and choose the best one for your kid!